Welcome to Day 3 of The Median Mommy's Preference for Prefolds Party! 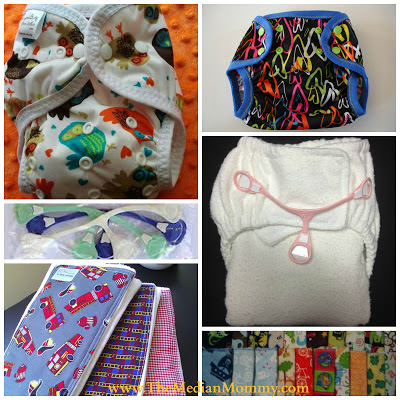 Prize Pack #3 is another amazing pack, full of wonderful handcrafted cloth diapering goodies! Green Mother Crafts is the result of Jo and Angela's more than 20 years of experience cloth diapering! Founded with a commitment towards the earth, Green Mother Crafts' goal is "to make affordable products that are functional, stylish, and have a positive impact on our environment." 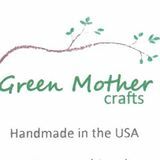 Selling locally for 3 years, Green Mother Crafts recently expanded to begin selling their earth-friendly products online. GMC's beautifully crafted items range from mama cloth, to wet bags, to cloth diapers and covers. I had the opportunity to try one of GMC's Hybrid Fitted diapers (and LOVED it), you can check out the review here. You can check out her latest creations and special offers on her Facebook page here. The beautiful creations of Rumor Has It are the handywork of Constance. I was drawn to Constance's Etsy store by the beautiful fabrics and designs she uses to create her handbags, wallets, burp cloths and blankets. You can also find her on Facebook here. Gotcha Covered Diapers is the handiwork of Emily Hicks, having started creating diaper covers for her cloth diapering daughter. Once she started, Emily said that she "fell in love with designing and making these!" You can purchase any of her fun and funky prints, with sizes fitting 2-40 lbs., in her Etsy store here. You can also see her latest additions special offers posted on her Facebook page. Amy Washington is the talented seamstress behind Mama Bear Baby Wear. Mama Bear Baby Wear offers a range of items appealing to natural parenting aficionados: carriers, wonderful wool covers and homemade lanolizing spray, training pants, diaper covers, hybrid fitted diapers and more! Snappi Baby, makers of the gadget that made diaper pins obsolete -- The Snappi! Check them out on Facebook! My favorite item is the Hybrid Prefold Diaper from Mama Bear Baby Wear, it would be something new for me to try!